Taking care of your hair is the only way to make it stronger and healthier, and having strong and healthy hair helps you feel more beautiful. Tricovel® products are the result of Giuliani Anti-Hair Loss Research with the goal to take care of hair, preserve and enhance its natural beauty. Because hair is part of our identity. Brittleness, loss of volume, thinning, progressive loss, alteration of the skin: there are different factors that affect hair and scalp, and behind them, there are specific causes. Each Tricovel® treatment is designed to offer solutions specifically targeted to a different hair need. In each Tricovel® line different types of products deal with the same problem in a different way: food supplements (tablets) nourish and protect hair from within; topical treatments (vials, mousses) target the action on the bulb, acting from outside; cosmetic products (shampoos, conditioners, masks) protect hair and complement the activity of topical and systemic solutions. 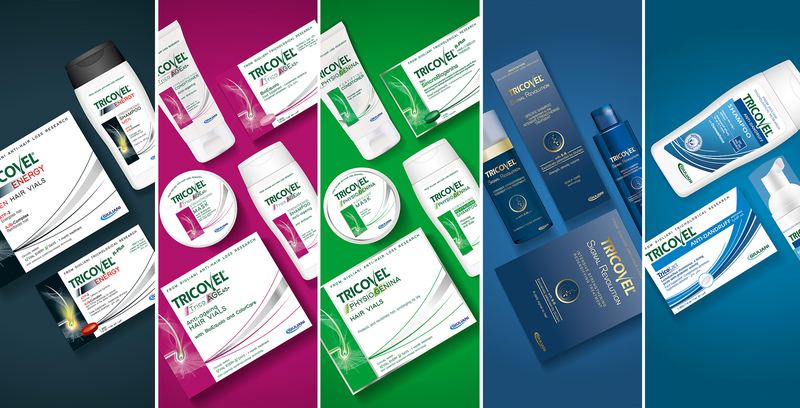 Tricovel® treatments stand out by the presence of patented active ingredients and exclusive release technologies, whose action has been tested with in-vitro studies and clinical analysis carried out under dermatological control. Tricovel® offers only clinically tested hair products. Synonymous with products that act on hair with effectiveness and safety, Tricovel® has developed three treatment lines for healthy hair and scalp. The line with Physiogenina (topical products) and NeoSincroBiogenina (tablets) is indicated to face temporary hair loss and give nourishment, strength and volume to hair. TricoAGE 45+ and Energy, on the other hand, are specific lines designed to act on the needs of women and men’s hair. The TricoAGE 45+ line, in particular, is ideal for restoring structure and shine to female hair made thinner by ageing, while Energy products infuse energy and strength to thin and depleted male hair. Tricovel® also offers an Anti-Dandruff line (tablets, mousse and shampoo); hair colouring treatments (Nutri Color line) that protect and nourish hair; Oil shampoos, designed to protect sensitive scalp and each of them working on specific hair problem such as dandruff, greasy, weak and dry hair. Tricovel®: a range of targeted and effective solutions. Choose the one that suits you best!